Leiden English Choir … is a dynamic and international group of people of many nationalities and age groups. We regularly welcome international students who are in Leiden for a period of time as members of the choir. Rehearsals are largely held in English. 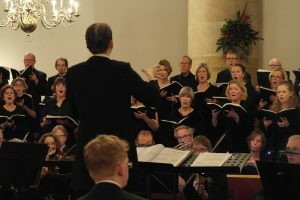 Two concerts per year … in and around Leiden: one in the Christmas period with, among other things, traditional carols from around the world – and a classical or modern concert in the spring of the year. We sing works by Britten, Vaughan Williams and Rutter, but also Pärt, Gjeilo, Vasks, Händel, Fauré , Rossini, Schütz, Lotti, and Byrd. Social and serious … we work hard and take rehearsals and our music seriously – always trying to achieve the highest possible quality. 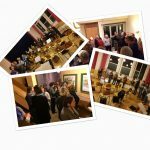 We are also a social group of people that enjoy spending time together – weekly visits to the local cafe after rehearsal, a monthly ‘borrel’ organized in turn by each of the voice groups in the choir, and post-concert parties to share in the after glow.